[pullquote align=right]I was relieved to learn that finally, a rabbi could have a family like mine. [/pullquote] More personally, I was relieved to learn that finally, a rabbi could have a family like mine. My father is not Jewish and neither is my wife. I have always lived in an interfaith household. I get that leaders and teachers should be held to different standards. They should inspire us to grow and take action for good. But knowing I’m often in Jewish situations where it’s okay for me to be in an interfaith relationship, but not for the leader, just feels condescending. It feels exclusionary. It can feel like you’ve already got a point against you when you’re trying to fit in. Whether they want to be or not, rabbis are role models. I should look up to them. I should aspire to do as they do. I should gain guidance from their actions and words. They should not be a distant celebrity, or worse, a proxy, doing the Jewish things I don’t want to do, maintaining the Jewish standards I don’t hold myself to. I don’t mean to imply that we need to agree on everything–I look forward to a good debate–but they do need to be accessible to have that debate. And I shouldn’t feel like I’ve already lost the argument before it started just because I married the person I love. Rabbis and rabbinical students should marry who they love. It’s a fairly basic 2015 standard that I would hold for anyone else. If I’ve learned anything else this year, it’s that representation matters. [pullquote align=left]If I’ve learned nothing else this year, it’s that representation matters. [/pullquote]Folks need to be able to see themselves in a variety of roles. They need to see themselves in their leaders. Call me idealistic, but I’d like a rabbi who can relate to my challenges; one who’s willing and able to empathize. 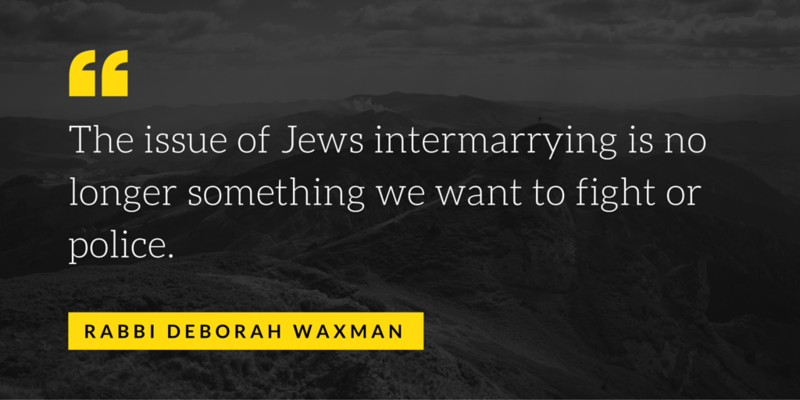 A critical mass of Jews are intermarried. Why continue telling them that their partners don’t matter? And 61% of families with a Jewish partner have decided to raise their child Jewish. There’s a good chance that kid will go to Hebrew school somewhere. The stats just tell the story of the reality I’ve always lived. I’ve spent the last three Yom Tovim with Reconstructionist congregations. I’ve found the services inspired and meaningful; with the right blend of tradition and progressive values. I was raised in a Conservative synagogue the general “feel” of those services still speaks to me. However, there’s a sense of adventure and daring that I don’t typically feel elsewhere. The rabbi’s yuntif sermons this year touched on connections between spirituality and activism, and Jewish issues of white privilege. The president’s Yom Kippur appeal talked environmentalism. [pullquote align=right]I felt right at home. [/pullquote] It was in fact a Reconstructionist rabbi who performed my wedding. I was hesitant to ask, not knowing the Reconstructionist stance or his own on the subject. It was then I was relieved–and overjoyed–that there was no issue. Given what I know and what I’ve learned, permitting rabbis to be in interfaith relationships is totally in line with their own values. This week, the Reconstructionist community has sent the message that I’m accepted and wanted. They’ve driven home the message that I can raise a family within their community. [pullquote align=left]They want me unequivocally and unconditionally. [/pullquote] Will there be bumps along the way? Of course there will be. But they’ve already extended their hand. We also know that not every congregant will immediately support a rabbi’s decision, let alone the decision of their greater rabbinate. Knowing that there’s a rabbi somewhere who’s on my side will make those conversations easier. The less I have to explain why my family has a right to be a part of the Jewish community, the sooner we can move on to doing Jewish together. The RRC is the biggest joke. And you need not worry, two women cannot get married to each other in Judaism. As the old joke goes, you can call it a fish, but that does not make it a fish.